What a beautiful autumnal week it’s been! As the weather begins to turn a bit chilly our children have barely noticed, as they have kept so busy! We started the week with an exciting den building activity; we used lots of mathematical language as we worked out which branches were best for building with, testing their strength and discussing their size and weight. The adults were also promptly told that we could not enter the den because we were all too big! It was so interesting to see how this activity evolved over the course of the week. Having a cosy space in our base camp seemed to lend itself perfectly to some family themed role play games, and also some ‘Three Little Pigs’ imaginative play as some big, bad wolves threatened to blow the house down! Almost as exciting as building the den and playing in it was dismantling it. Whilst some children were a little disappointed to see it go, we could see that there were so many learning opportunities here as they all negotiated the fate of the den and revisited the experience of discussing each component (again using so much maths related language!). Due to high demand it promptly got reconstructed the following day! We have also been enjoy other forest school activities this week, building a big fire to toast some marshmallows on and using tools to create elder wood beads to string into necklaces. We spoke about the importance of safety when engaging in these activities and allowed to children to share their knowledge and experiences around this subject. Nikki, our forest school leader feels quite confident that some children will soon be able to progress onto using sheath knives! A big milestone in their use of tools :) We will, of course make sure that the children are confident with whittlers before moving them onto the sheath knives. 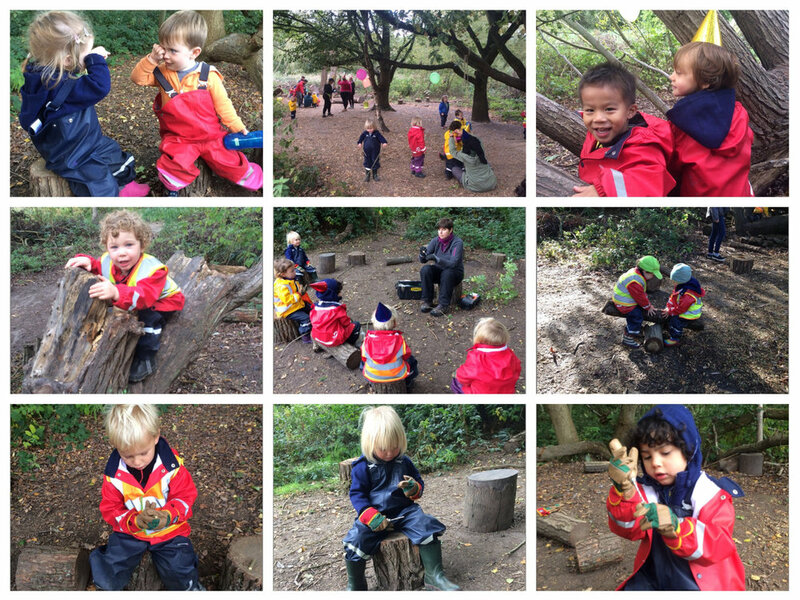 In addition to these lovely activities we have been enjoying our usual adventure walk fun! This time Karin and Colleen took some rope with them and the group were able to make an excellent rope swing suspended from a bridge. The children loved being daring and swinging over (very shallow!) water. Shallow, but just deep enough to get delightfully wet and have a fabulous time! We are continuing with our Friday night disco and once we have got it all settled we would like to invite non-Friday children to book in to come if you would like to. Watch this space for further updates! It seems to have turned properly autumnal this week with a bit of a chill in the air! It's glorious when the sun comes out but mornings have been a bit nippy! We recommend packing a pair of gloves into your child's bag next week, just in case! Book October half term holiday camp in Chiswick including a Halloween party on Friday! We also have some places available in our new Fulham site opening this month!